Cameroonian sweetheart Charlotte Dipanda has been making waves again in recent weeks. Musically,she featured on the track “One love” by Shareem and her vocal input is surely going to create buzz around this particular track. This is the first time people are going to hear her silky voice in a hiphop song. Otherwise, she has been putting her star power to work by supporting good causes. She was present at the official launching ceremony of the “Maison de l’enfance” project which is intended to build a structure for children. This is upon the initiative of the Yaounde Rotary Club. The launching ceremony took place at the Djeuga Palace Hotel in Yaounde. Her presence surely added extra colour to the event because that lady glows like an angel. Who said beauty and talent couldn’t be friends. Enjoy the “One love” track below. Cameroonian sweetheart Charlotte Dipanda is going to keep her promise. Just as she promised last December during the launch of her musical composition “Dube l ‘am” she will be in Cameroon this March for a series of concerts. This time around she will be accompanied by her entire band. 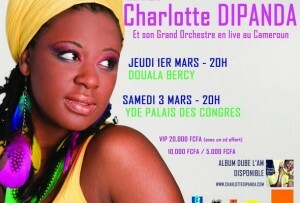 Two live concerts have been slated: March 1 at Douala Bercy and March 3 at the Conference Centre in Yaounde. Since featuring alongside greats like Jeannot Hens in the song “Ndando“, the artist has built an impressive resumé this far working alongside world music powerhouses like Lokua Kanza,Manu Dibango and a string of others. 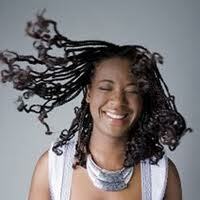 With two albums to her name,the sultry singer is etching her name near others like Angelique Kidjo and Sally Nyolo. Her legend is slowly and steadily taking shape. 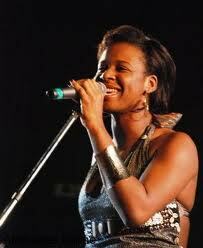 During a performance at the “Promote” expo ,she moved a grown man to tears with her song “Na nde” . You can witness that surreal moment in the video below. Those wishing to attend the March concerts should remember:VIP ticket = 20,000 frs. The others cost 10 and 5,000 frs. respectively. Yeah,great music doesn’t come cheap. After the release of her second album ‘Dube l’am’ –’ ma foi’ in the french appellation (my faith), diva Charlotte Dipanda has decided to come closer to the Cameroonian population granting them the opportunity to savour her music home first for charity begins at home. She will be offering two spectacular concerts in the cities of Yaounde and Douala on the 9th and 10th of this month at Cabaret la Taniere and Cabaret H as from 8pm respectively. 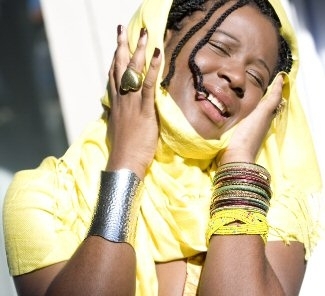 The singer who does a mixture of acoustic and traditional jazz using the Duala, Bakala and French languages to come out with sensational soft melodies uses Dube L’am to express her beliefs, emotions and a much more mature faith than in ‘Mispa’ her debut album with features from Congo’s Lokua Kanza in ‘Kumb’élolo’, Cameroon’s Richard Bona in ‘Bodimbea’ and Jacob Devarieux in ‘We nde ndja’. Wow ! what a rich combination for Dube L’am ! Sultry singer, Charlotte Dipanda has returned to the limelight with a brand new album entitled “Dube l’am”. The official presentation took place yesterday.The 14 -track album,by her own admission,is a vast exploration of diverse rhythms and instruments.It includes two duets,one of which is with Kassav front-man,Jacob Devarieux. Fans of the singer should be patient,as the promotional tour will begin early next year.After having entertained and thrilled since her duets with Jeannot Hens before going solo,this album will surely be another treat for lovers of music drenched in acoustics and soulfulness. Koppo has just been nominated for the prestigious Concours Decouverte RFI alongside Sanzy Viany. Here is a live performance of one of his popular hits ”J’en ai marre ‘ featuring Charlotte Dipanda @ Palais de Sport, Yaounde.